Another Stamp Something Challenge I went back to was a sketch. I love sketches - it is a challenge in that you have a specific format to keep to while yet another challenge to find an image to fit with that format. Colors aren't usually an issue when they aren't specified I just pick something I like usually the pattern first then find colors to go with it, as was the case for this card. 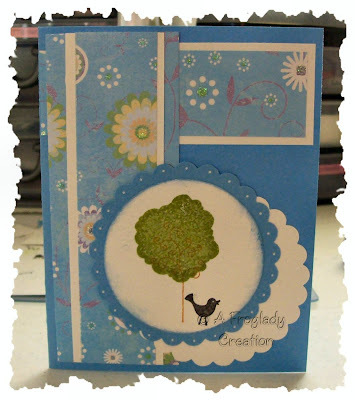 I choose some DCWV Pocket Full of Posies paper that has a little bit of texture and sparkle to it then paired it with some solid white and blue paper to create the layers for the sketch. I used several colors from my Palette Ink pads for this card: Landscape, Seascape, Cognac, and Noir. The Cognac was the tree base and then I used the Landscape over it for the tree top. The Seascape was used to make the "sky" on the top circle. I also used this cool pen to add the white dots along the scallops of the blue circle. it is a Permapaque - Opaque Pigment Marker from Sakura. If you see one grab it and give it a try - great for doodling with and adds a little flair to your work with darker papers. Have a wonderful day ...hope it is better than mine as I sit and wait for the House Dr to call as last night the ceiling downstairs caved in due to our water heater leaking which once again when I said something to several people all they did was tighten it up but within a few days it was leaking again and well now a whole floor issue to deal with and a ceiling issue downstairs along with the carpet being soaked to the gills down there too!